Normally, when sailing to windward one picks a sailing direction which maximizes the boat’s progress in the direction of the wind. However, in variable winds it is often better to bear away from the wind to increase speed at the expense of direction. The pictures give an exaggerated and oversimplified example. In this first picture, the green boat on starboard is slightly ahead of the red boat on port. The green boat passes just in front of the red boat. Then there is a 45degee wind shift to the left. The green boat tacks. 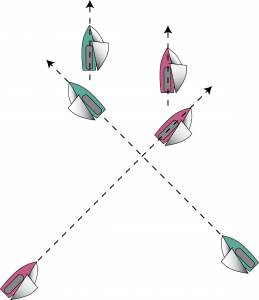 In the final position at the top of the figure, the green boat lead has increased because it was sailing toward the wind shift. 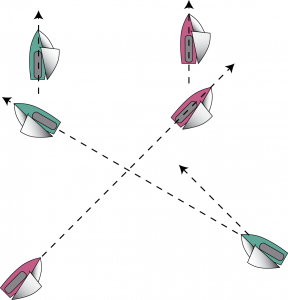 In the second picture, the green boat anticipates the wind shift and sails more to the left. Although this forces the green boat to pass behind the red boat, the green boat’s lead has been increased by this course change. This entry was posted on Friday, August 6th, 2010 at 8:41 am	and is filed under Racing. You can follow any responses to this entry through the RSS 2.0 feed. You can leave a response, or trackback from your own site. Sorry: I just don’t see the green boat’s increased lead in the last diagram. Wher do you buy the magic box that tells you when there is going to be a 45 deg wind shift, I could use one!